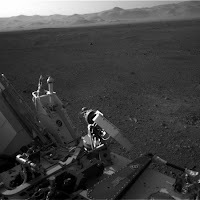 Not only send amazing images of Mars, robotic rover of National Aeronautics and Space Administration (NASA), Curiosity is now photographing the first images of asteroid sightings that seen from the surface of the Red Planet. Historical asteroid image that generated by Curiosity shows of the Martian sky shows Ceres and Vesta, the two largest space rock in the asteroid belt of the solar system - between Mars and Jupiter. The two objects will be quite clearly seen with the naked eye by those who exist on the Red Planet. Curiosity is about the SUVs size have the imaging system on the "head" called Mastcam. Instruments that are capturing the asteroid sighting on April 20, 2014. 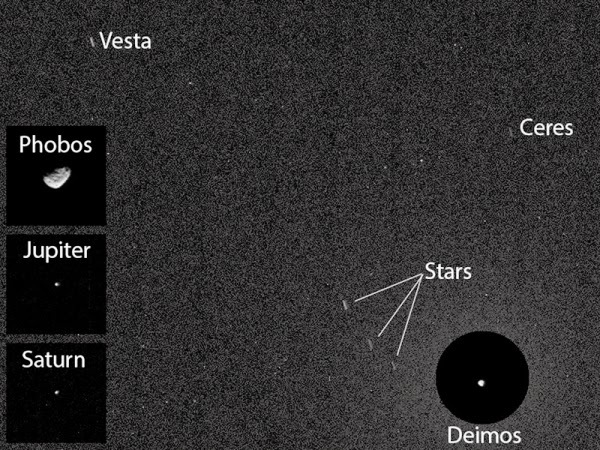 Rover is actually only intended to take a picture of 2 moons of Mars: Phobos and Deimos, but some asteroids appear as faint lines. Even with the Jupiter and Saturn. "This image is part of an experiment to check the opacity in the atmosphere at night at the Curiosity site on Mars, where ice clouds and fog formed during this season," said Curiosity camera team member, Mark Lemmon of Texas A & M University, as quoted from SPACE.com, on Saturday, April 26, 2014. "Two Martian moons is the main target in the evening, but we choose the time at which one of the the Red Planet satellites are close to Ceres and Vesta." With a diameter of about 950 kilometers, Ceres is the largest object in the asteroid belt. It looked like a ball. It was the first asteroid discovered - by Giuseppe Piazzi in 1801 - and is now considered a dwarf planet. Meanwhile, Vesta that have a width of 593 km, is the third-largest object in the asteroid belt, although it was the ranking two of the masses.